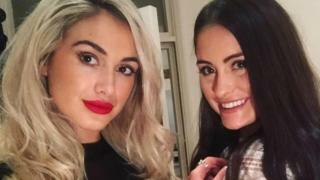 Two Australian sisters have described the confusing aftermath of an acid attack at an east London club. Isobella Fraser, 22, and her sister Prue, 20, both suffered burns when a man sprayed at least 12 people inside Mangle E8 in Hackney early on Monday. They had been separated in a preceding scuffle inside the venue which officers believe involved two groups. Isobella said she suffered painful burns, but initially had no idea what had happened. "I thought someone scratched me on the back because it was just stinging really badly," she told the BBC. "All I could smell was gas and it was really hard to breathe and I thought, 'Oh my, God," someone's bombed the club." The pair said they arrived at the club about 23:30 on Sunday and were enjoying drinks with friends when a fight broke out about 90 minutes later. They were separated in the scuffle. "The next thing I remember is being pushed over this barrier fence," Prue said. "I felt pain that I've never felt. It was like someone set my arm on fire." After being evacuated from the club, the sisters admitted themselves to hospital. "You can see the splatter marks on my back," said Isobella. "I'm probably going to scar but I'm just glad I didn't get it on my face or in my eyes." A London Fire Brigade spokesperson said: "The only information that we have is that it was an unknown corrosive substance thrown within the nightclub."